Masked Performance In the fifth and sixth centuries before the birth of Christ an ancient civilisation reached such heights of intellectual and artistic achievements that every succeeding period of western culture, from the roman empire to the twentieth century, has been heavily in it's debt, whether acknowledged or not. Those momentous years saw the beginnings of history and political theory and the development of philosophical thought. In those years architects designed the temples which have dominated our concept of civic concept of civic building ever since, and sculptors imposed on us an ideal vision of the human form which remains the point of reference even for those artists who turn against it. 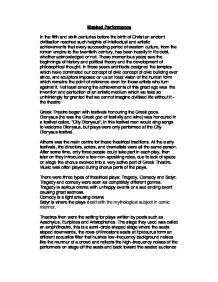 Not least among the achievements of this great age was the invention and perfection of an artistic medium which we take so unthinkingly for granted that we cannot imagine civilised life without it- the theatre Greek Theatre began with festivals honouring the Greek gods. Dionysus (he was the Greek god of festivity and wine) was honoured in a festival called, "City Dionysus", in this festival men would sing songs to welcome Dionysus, but plays were only performed at the City Dionysus festival. 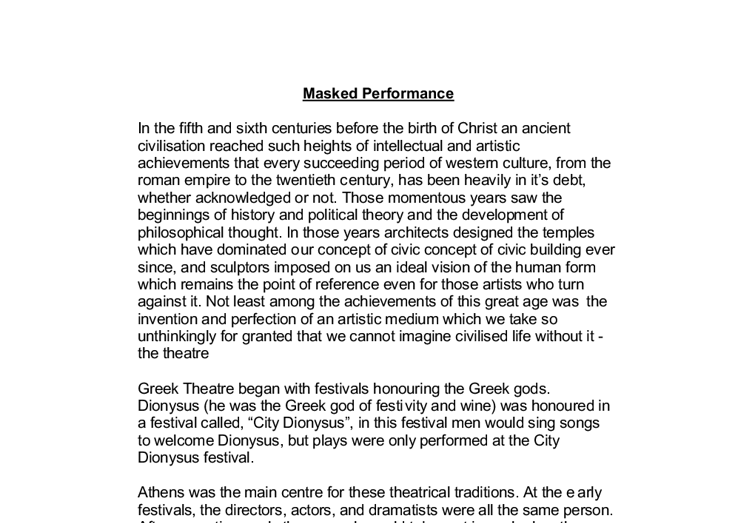 Athens was the main centre for these theatrical traditions. At the early festivals, the directors, actors, and dramatists were all the same person. After some time, only three people could take part in each play, then later on they introduced a few non-speaking roles, due to lack of space on stage the chorus evolved into a very active part of Greek Theatre. ...read more. After drawing the eyes I realised that it looked like duck eyes, so I chose to be a duck. Once I had drawn my eyes, I had to decide what nose to use. Once again we had a choice: button nose, long nose or a beak, of any size. I used a beak, which originally started as a pointed triangular shape, but after I had fixed it onto the cardboard with masking tape I realised that it didn't look like a duck's beak. So I sat starring at it for a while trying to work out why it didn't look like a beak and after about 15 minutes of staring I realised that ducks don't have a point on their beak they are slightly rounded. I then cut it to a rounded end and it looked perfect, I added eyebrows to the eyes, by twisting some newspaper into long strips and securing them onto the cardboard with masking tape. I then started to papier-mache. (This is where you put paper into PVA glue and stick it onto the cardboard) and after a few coats it will make the mask stiffer and less likely to bend about whilst acting in it when on stage. All together I believe that I did around 7 layers of papier-mache. I then had to make a cradle so that the mask would stay on my face, to do this I cut two pieces of long cardboard and then I got my sister to connect the two pieces to the mask and then I could secure it with papier-mache. ...read more. Some of the things I don't think worked are where Quackers scared Gobbles away from here master- I don't think this worked as quackers wasn't loud enough or scary enough. Projection wasn't very good either with some characters; preventing people towards the back of the audience couldn't hear you. We also needed to be aware of the stage and make sure we used it all, as I don't think we used it as much as we could've done. I think we probably could have added a few more comedy points into the story so the children could have enjoyed it more, as watching the other group they had more comedy and the children certainly enjoyed it more. I also think we could have made the moral stand out more in the story. My mask had brilliant peripheral vision I could see everything that was going on, on stage beside me. I also had some stark contrast on it with the dark eyebrows and then the bright red face. Also the contrast between the purple and indigo feathers worked better then I thought it would. It had a good nose space to allow good projection, and also the feathers being able to move around on split pins worked well as they made it look even more real like. I needed to take care a little more when painting as after the paint had dried I had realised that the left eye had dripped red paint onto the dark coloured beak. ...read more. Today the audience sits on padded seats so the audience is more comfortable. This is because people have higher expectations today and society is generally more advanced, people would not sit on stone seats today. In ancient times audiences were much larger as they could fit more people into the theatres. Evaluation of Live Theatre Performance, Case-Study: 'Bouncers' by John Godber. Lucky Eric spoke with extreme feeling. "Give me a kiss, they said", said Lucky Eric about the men in the bar. When explaining this, his tone of voice got loud and full of rage. To add to the image of unity and stature, identical masks would have also been worn. Masks were made from materials of the time: wood, feathers, ceramic or material. As the chorus had to have fifteen masks I believe they would have opted for a durable yet easily workable material such as wood with little or no decoration. I dance. And I feel better!"(p. 79). The quote clarifies the meaning of the dance to Zorba and defines it as being a method to give on outlet for that which is too powerful to be expressed in words. The dance is thus a transcendent language for Zorba. In order to portray this new theatre, there came a need for a new style of acting, and not only this but a totally different approach to performance. A critic described one of Piscator's early productions, 'Fahnen', as 'epic', and consequently he built on this idea. Inevitably, this meant that plays were more energetic and professional. Secondly, the costumes were heavy. This meant that there could no sudden movements made by the actors during the play. This actually meant that actors would move dignified and also this meant that the scenes were actually clearer for the audience so there was no confusion between audience and actor. and Helia the wife, she was desperate, almost obsessed with wanting a child but Elizabeth's character isn't interested. In the prison scene of Chicago (mentioned in "inspirations" and "research") they all chant one word which describes their story of what happened between them and their men (why they killed them).